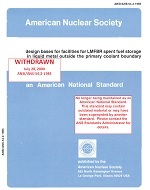 This standard presents minimum design requirements for facilities used in storage and preparation for shipment pf spent fuel (including blanket material) at LMFBR power stations. 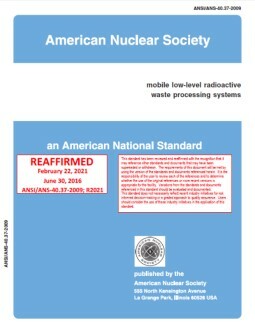 The standard contains requirements for the design of the ex-vessel storage tank (EVST) systems for decay heat transfer by liquid metal make-up, instrumentation and cleanup systems, EVST structure and integrity, radiation shielding, ventilation, and filtration and radiation monitoring systems. The standard also specifies shipping cask interface requirements, including illumination, radiation monitoring, and requirements for handling and decontamination of the shipping casks. Design requirements for building structure and integrity, including requirements for ventilation, containment, and communications are also included.